Fluffy, slippery, short and very fine fibers can get stuck in the teeth of the licker-in and drum carding cloth when processing them all on their own, requiring meticulous cleanup with the doffer brush before moving on to your next project. You have probably experienced this issue as well if you like working with sparkly fibers such as angelina and firestar or colorful recycled sari silk threads. Those long, thin fibers can stubbornly hide in the teeth of your carding cloth, only to somehow find their way into to your next project (it’s the Murphy’s Law of drum carding!). 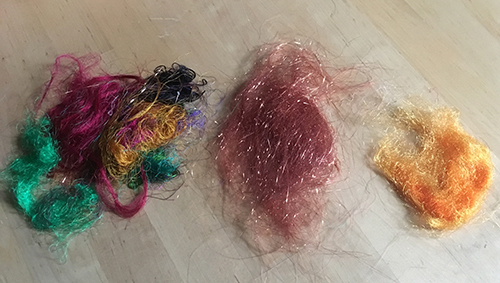 From L-R: Recycled Sari Silk Threads, Angelina Sparkles, and Dyed Firestar Fibers. As you feed this “sandwich” into the carder, lay your hand flat, palm down, on the fiber “sandwich,” pressing down on the fiber and moving your hand toward the drums at the same speed the fiber is moving. Repeat until all of the fiber is carded onto the drum; this pressure will prevent the middle layer from slipping out of the “sandwich” and will result in all 3 layers transferring to the large drum. 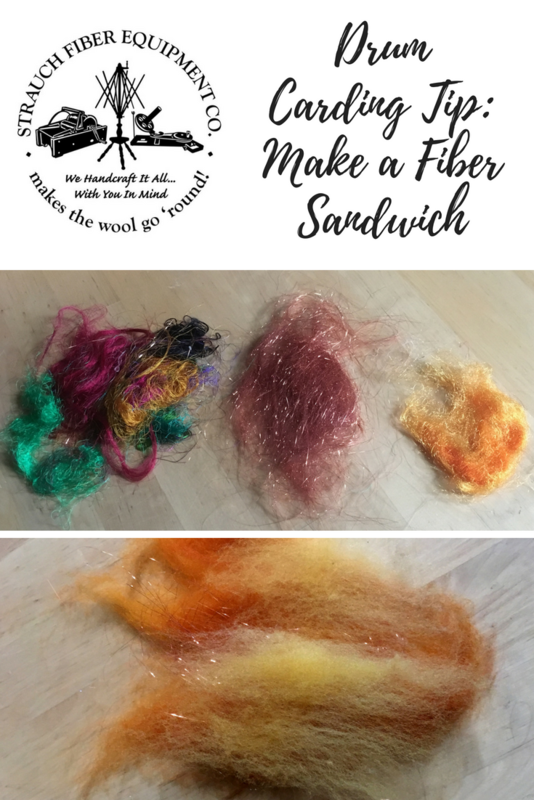 The “sandwich” method works best if you have already filled your carder with a base layer of wool: by adding sparkles, fluff and stuff as the final (or second-to-last) step, you will minimize the amount of residual fibers to be cleaned out later with the doffer. This simple technique will save you time and while also ensuring beautiful results every time! For more great drum carding tips, click here to sign up for our newsletter & receive a PDF download link for Drum Carding 101, our FREE guide to drum carding. Like this post? Pin it for easy reference later! This entry was posted in Carding, Freebies and tagged drum carding, Drum Carding 101, fiber prep. Bookmark the permalink.